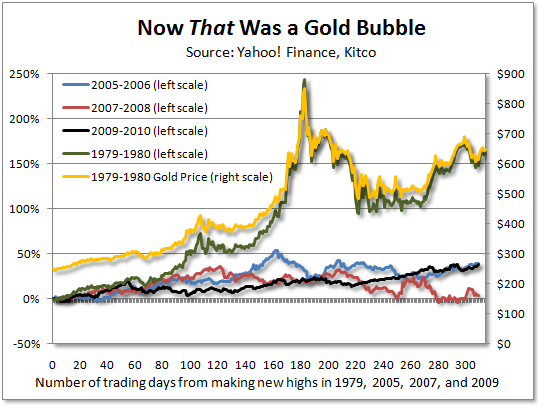 Tim Iacono provides a in-depth analysis on why the gold price is nowhere near its peak yet. He says that we are still far from the mania phase in the West, but we are seeing the early signs of "gold fever" in China as demand soars. 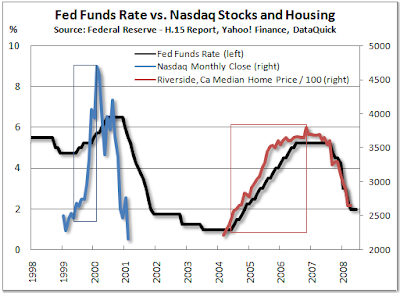 See the following post from The Mess That Greenspan Made. As the gold price continues to regularly make new all-time highs and with the price of silver posting spectacular gains in recent months, now seems like a good time to try to answer the question of whether we are anywhere near the end of this long-term cycle and what signs one should look for when considering whether to sell your gold and silver. Like all other secular trends, this one too will surely come to an end someday and, given the events of the last year or so, it now seems quite possible that the end may come sooner than the 2013 time frame I’ve often cited, so, giving these questions due consideration sooner rather than later makes good sense. First and foremost, in my view, at current prices we are nowhere near the top. I’ve long said that we’d have to see prices closing in on the inflation-adjusted 1980 high for gold – roughly $2,300 an ounce today – in order to even contemplate exiting positions in precious metals for good and we remain well back of that at about $1,400 an ounce. The other major chart criteria to look for is a “blow-off top” similar to what was seen 30 years ago and, as shown below, what we’ve seen in recent years haven’t been bubbles at all – at least not compared to what happened in 1979-1980 when the gold price moved from about $250 an ounce to its January 1980 peak of $850 an ounce in a matter of months. Now, there are a couple of very salient points about that peak on January 20th thirty years ago, the most important one being that it happened fast and didn’t last long. The gold price doubled in just over a month and closed above $800 an ounce on just two days. It closed over $700 an ounce on just six days and, for the month of January, the average price was a much more modest $675 an ounce, so, one thing that should be understood early on is that “catching the absolute top” is virtually impossible. If, back in 1980, you’d have sold all your gold at over $600 an ounce you’d have done well. After peaking in January and then correcting to under $500 an ounce in the spring, gold prices over $600 were available for much of the rest of that year, in fact, the average price in September of 1980 was just two dollars lower than in January at $673. But, after 1980, a $600 gold price wouldn’t be seen for another 26 years. Importantly, after the parabolic rise that ends trends like these, there are lots of “true believers” who will stick around and help produce a big bounce up as was the case for the Nasdaq bubble (see chart two sections below), but, for all intents and purposes, the party is over after this “blow-off top” occurs and you’d probably be better off looking at where to put your money next rather than hanging around in precious metals. As for silver, a closer look at the details behind the 1979-1980 surge to almost $50 an ounce (see this chart) reveals that this is not a very good yardstick by which to extrapolate future events. The silver price tripled from $5 an ounce to $15 an ounce during the first 11 months of 1979 and, then, from December to January, it tripled again to its peak of $48 on January 21st. This price surge was very much a market anomaly due to the Hunt brothers briefly “cornering the market” and is only likely to be repeated if another market anomaly arises and, though an ongoing short-squeeze might fit that bill, I wouldn’t count on it. As opposed to an average price of $612 for gold in 1980, down about 28 percent from the January peak, the average price for silver that year was about $20 an ounce, almost 60 percent below the peak. I’ve long thought that inflation-adjusted highs for silver of about $128 an ounce today are quite misleading. Using the average 1980 price to produce an inflation-adjusted equivalent of $53 an ounce today is likely a better gauge of where prices might go in the years ahead. Once again, the key points here are that gold and silver prices remain well back of the inflation-adjusted highs from 1980 and secular trends such as these are normally punctuated by a parabolic rise in prices and we’ve yet to see anything like that which occurred when precious metals last reached a long-term peak. A clear sign that we are nowhere near a peak for gold and silver prices is that, in the Western world, there is no mania. Now, one could argue that in Asia they are quickly approaching that point and this is discussed in the next section, but, in the West, gold as an investment is still largely considered to be a curiosity at best and “gold bugs” are still considered to be a bit loonie, despite having been right about rising precious metal prices for the last decade. Institutional investors and investment advisors are certainly aware of precious metals as an investment class – after ten years of gains that have trounced equity market returns, they should be – but most have still not looked beyond what has been drilled into their heads over the last 30 years in that prudent investing consists of stocks and bonds only. Sure, now that the gold price has moved from under $300 an ounce to over $1,400, today you can read that Money Magazine thinks you should have a five or ten percent allocation to precious metals and related stocks as an inflation hedge, but this is really just lip service. Five or ten percent will do virtually nothing for your overall investment performance. In my view, to have a major impact on your overall returns, a weighting of 40, 50 percent or more in precious metals and related shares (as has been the case for the model portfolio since its inception) is required. I don’t expect this view to become conventional wisdom in the years ahead, but a move up from 5 percent to 20 or 25 percent will make a world of difference for metal prices as these markets are not very big. 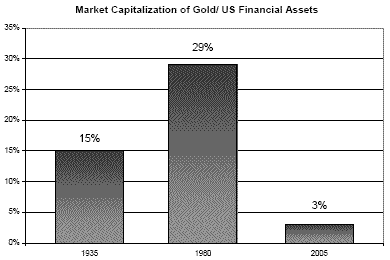 While I don’t know the source for the data in the chart below from this 2006 article at USA Gold, it is consistent with what I’ve come to understand about the gold market relative to other asset classes and how this relationship has changed over the last three decades. Today, you are likely to see a number between five and ten percent – consistent with the Money Magazine advice – but, a move sharply higher has yet to develop, despite the popular SPDR Gold Shares ETF (NYSE:GLD) now being the second largest ETF in the world with assets of $57 billion. We are getting closer, but we are still far from reaching the mania phase for precious metals in the West and anyone who thinks that the Cash4Gold craze a year or two ago signaled a price peak (at around $1,000 an ounce?) should, by now, understand that this was simply a huge wave of individuals selling their valuables during a nasty recession where people needed cash to pay the bills. Moreover, anyone thinking that Glenn Beck and any other Fox News shows that advertise and promote gold are signs that prices have reached a peak would do well to understand that cable news viewers buying a few hundred or a few thousand dollars in gold are just a tiny, tiny portion of the market, the notoriety being inversely proportional to the impact on metal prices. It will be wealthy individuals, institutional investors, and investment advisors that will have a much greater impact on the supply/demand dynamic and these groups have yet to make the leap that some Glenn Beck viewers have. While gold related products are now widely available to anyone with a brokerage account, they are not yet “mainstream” and all one has to do is ask their friends and neighbors if they own any gold or silver. It’s been my experience that almost everybody knows about the rising price of gold, but hardly anybody owns any. This will soon change, but, before it does, investors must get past the notion that gold is a “barbarous relic” and undo decades of indoctrination from the likes of Warren Buffett who, even after more than a 400 percent increase in the gold price over the last ten years (during which time Berkshire stock has only doubled), has no use for the metal. Investing in gold has yet to be broadly accepted by the public, but it will in the years ahead, and one way that you’ll be able to tell is that you’ll see investment companies touting their gold products rather than simply providing the occasional gold-related article or two when communicating with their customers. I’ve been with Fidelity Investments for more than ten years now and I’m just starting to see email from them pointing me to their latest article about investing in gold stocks even though they’ve had a gold mutual fund since the mid-1990s. Half way around the world, things are quite different when it comes to investing in precious metals and part of this has to do with the fact that governments recommend and promote it. In both China and India, there are now early signs of “gold fever” with new investment products being launched weekly and soaring demand from individuals from all socioeconomic levels. Rising inflation in this part of the world is a key factor in this development and this is why, in my view, we are likely to see the real “gold mania” begin to develop first outside of the U.S. as both China and India are already seeing rising inflation and have begun to tighten monetary policy and raise interest rates. This contrasts with conditions here in the U.S. where, despite record prices for some commodities and oil prices that are now back at about $90 a barrel, policymakers are still more concerned about de-flation than in-flation. Recall that the 1980 price peaks for gold and silver came at a time when consumer prices had been rising for years, the inflation rate reaching 11 percent after the first oil-shock in the mid-1970s before falling and then surging again later in the decade under the disastrous Fed chairmanship of Arthur Burns, only to climb to more than 14 percent just as precious metals reached their highs in 1980. Now, inflation is calculated much differently today than it was thirty years ago, so, I’m not sure that it would be possible to have a government reported inflation rate of 14 percent anytime in our future. For example, as shown to the right, the shelter component that included home prices rather than today’s nefarious “owners’ equivalent rent” accounted for nearly half of the 14 percent inflation rate in 1980. Combine this major change with others such as hedonic adjustments, product substitution, et. al. 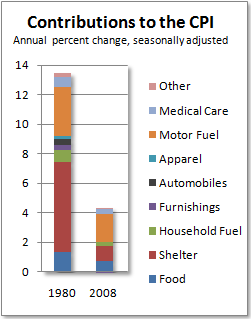 and government economists may have succeeded in guaranteeing that we’ll never see double-digit inflation again. Nonetheless, inflation rates of five or eight percent in the U.S. will likely feel about the same way that 14 percent inflation felt thirty years ago. Perhaps more importantly, inflation rates that are already at five or eight percent in China and India will drive policymakers to further tighten monetary policy there and likely lead to higher metal prices. Today, one has to ask the question of whether rising inflation and rising interest rates in China and India are already pushing metal prices toward their bubbly manic ending. History shows that inflating asset bubbles don’t really kick into high gear until policymakers begin to take steps to slow the trend, only to find that their timid steps reinforce the very trend they are trying to slow as investors and speculators become emboldened, pushing prices even higher. The Fed funds rate rose steadily with the gold price in the late-1970s until Paul Volcker became Fed Chairman in late-1979 and crushed inflation (and metal prices) by jacking up short-term lending rates to nearly 20 percent in early-1980. 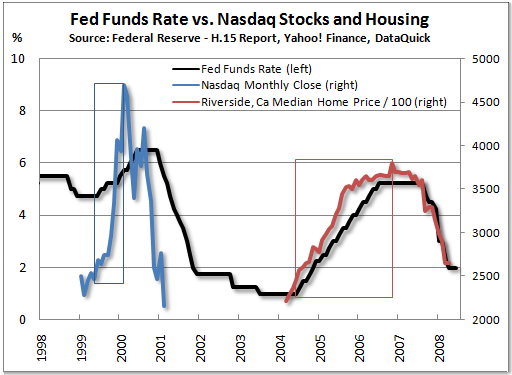 More recently, neither the Nasdaq bubble or the housing bubble really got going until monetary policy tightened as shown below. This process may already be underway in Asia where investment demand for gold and silver has reached new highs and, as is the case for other aspects of the global economy, these two nations may be in the driver’s seat when it comes to pushing gold and silver prices to their secular peak. This is why I’m no longer quite as certain that we’ll have to wait until 2012 or 2013 to see prices peak as a major prerequisite for higher gold and silver prices – rising inflation and rising interest rates – is already in place … in Asia. Whenever it is that gold and silver begin their final ascent, there should be clear signs that the end is near – maybe not so much in the U.S., but certainly in China and India, so, it’s worth paying close attention to development there. Until that time, just hang on tight.